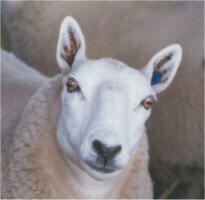 home of canine agility and Border Cheviot Sheep! Welcome to our home on the web. Aussium Agility & Twenty Mile Farm are located in beautiful Nipomo, California. 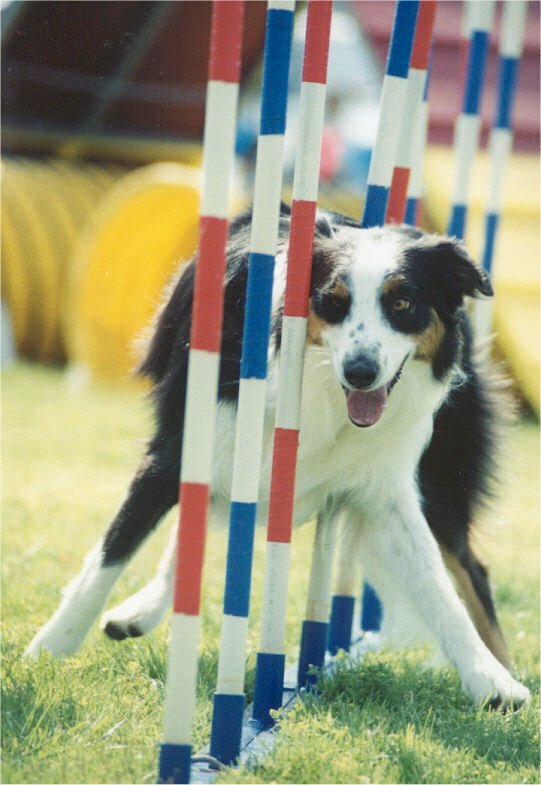 Aussium Agility was put together in 2000 because Ben, my rising Aussie agility star, refused to run where we were currently training. As a novice agility handler, I was amazed to find how strong an emotional issue could be for even the most competitive dog. Ben had been attacked, several times, and could no longer concentrate on agility at that location. That meant that I had to find somewhere else for him to run. The obvious choice was on our own 20 acres, so one of the sheep pastures was overhauled with DG/sand footing to cover the black clay. Agility obstacles were ordered, and we were back on our way! Because we were the only game in town, others came to train and work here, under the driving concept that dogs had to ‘earn’ the right to do agility. If your dog can’t play ‘nice’, and at least ignore other dogs, they can‘t work in a class situation here, and must do privates until they can be trusted in class. Period. No exceptions. In order to work as a team, dogs must feel safe where they train. That was my first commitment. Your dog WILL feel safe here. My second commitment was to physical safety, for both members of the team. The equipment and footing must be safe, and at competition level. I spend a lot of time and resources on maintenance, but know of no other way to achieve this goal. Both the grass training field and the agility arena are lighted, so safety is not sacrificed if a class runs over time. I am conscious of the fitness of the teams, and 30+ years of working with competitive jumping horses gives me the foundation to bring dogs to a level of fitness for the extreme sport of agility. Not to mention the experience gained from working with and for my husband of 37 years, who was formerly a large animal veterinarian, and now deals only with small animals. 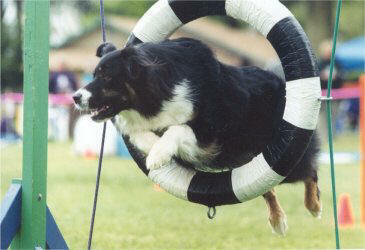 My third major commitment is to the joy and fun that agility represents to me. It is always the dog’s choice to run and work with us, and all errors are generated by the human member of the team. The dog is simply executing requests as they are processed, they are completely at the mercy of the information they receive. Chris Bach’s Third Way underlies all training here. Force has no place, but consequences are always present, and operating on the team. If the handler can’t find the fun, they need to train somewhere else. I can’t participate in anything that works on the sensitivities of a dog. If it is painful to watch, I want no part of it. My Aussies taught me about the joy and speed of agility, and I know no other way. It is my goal to maximize the fluency and competence of all teams training here, while maintaining the unique style of each handler and dog. It is a constant delight to shepherd teams through the learning process, and watch each partnership take form. I am constantly amazed by the confidence and communication that develop, given a positive, supportive foundation. Not everyone who finds their way to agility sees ribbons and titles at the end of their journey. But everyone does come to the realization that it is the journey, not the destination, that matters. Forming a partnership with your best friend. Testing yourself against the day, you and your dog alone with the course. Those are the moments that stay with you forever. Those are the gifts of agility, and all dog training. Our dogs are with us all too short a time. We know that when we begin the relationship. Agility is an extreme sport, and unforeseen events can end it much too quickly. One of the biggest lessons we learn with an agility dog is that each run, in competition or practice, could end up being our last. We never know when the game will end, so it makes each moment of that special connection that much more valuable. The wonderful part is how vivid those agility moments remain in our hearts and minds. It is such a gift. I teach agility because I want to share that gift and be part of that joy. It truly is that simple. My Border Collies have taught me about work, and doing what has to be done. The Aussies have taught me to find the ‘party’ in life, where the joy lies. On the following pages you will find lots of photos of our dogs and some of the other dogs that take our agility classes. Also you'll find class schedules, registration forms and lots of other information that we hope will help you in your quest for agility titles! If we can help you with answers to your questions, please send us a note!